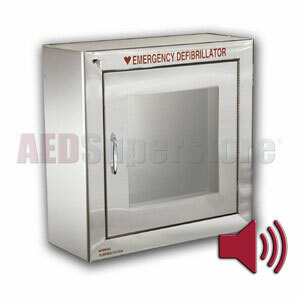 Stainless Steel AED Cabinet with Audible Alarm. When good looks matter, this sturdy and attractive cabinet is ideal for both indoor applications and sheltered outdoor applications. Door-activated audible alarm alerts everyone in the area the AED has been deployed for rescue. AED cabinet was good for the area we needed it in but door seems a little too flimsy. Rivets holding door were very loose with no way to tighten them. Alarm is loud (which is good) when you open the door.